Five years and a few weeks ago, some guys came by my office to see if they could interview me for a documentary the next day. I said sure. Then I didn’t show up. Fortunately, they were persistent and came by again the next day, and I sat in front of their camera for an hour and looked into the filmaker’s unbelievably distracting blue eyes and told my story of being involved with the demise of Portland’s Critical Mass. The filmmaker was Joe Biel, who agreed to go on a date with me shortly afterward and has stuck around through thick and thin ever since. 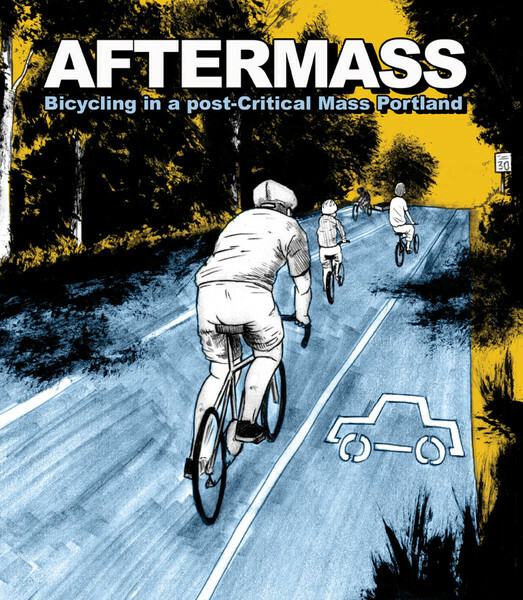 And the documentary is called Aftermass: Bicycling in a Post-Critical Mass Portland and it’s having its Portland premier screening at the bikey Clinton Street Theater on May 23rd from 7 to 10pm. I’ll be there for a Q&A along afterward along with some other folks who were interviewed in or involved in the production of the film. It’s hard to say adequately what this movie, or Critical Mass, means to me. I haven’t written much about it, even though it’s what sparked my interest in the politics of bike activism and my belief in the importance of community organizing. My involvement at the tail end of Critical Mass’s time in Portland deeply shaped my perspective and my career, which might otherwise have gone in a very different direction. This documentary brings it all back—what I witnessed first hand that changed my life is only a small portion of what you’ll see on screen: the abuse of authority, the violence of traffic, and the power of the people. It goes deep, and maybe that’s why it’s so hard to write about. It’s not always easy to watch, either, but I think you’ll agree that it’s worth it, especially considering how far those troubled years brought us. If you’ve ever wondered if Critical Mass does more harm than good, why it no longer happens in Portland, or what factors really caused our city to become so bike-friendly, I recommend seeing this movie. Scratch that—I urge and implore you to see it. Especially if you’re one of the many folks who moved to Portland in the early or mid 2000s, once the worst of it had blown over—this movie will likely change your whole perspective on the history of the bicycle movement and your own role in the future of it. Along with the screening on the 23rd in Portland, you’ll have a chance to see the film in Santa Monica, San Diego, and Oakland in mid-May. Details coming soon! And Joe will be showing the whole movie at some of our events on the upcoming Dinner and Bikes tour, details to be announced. Aftermass DVDs will be available at all events (if you can’t make it to any of them you can mail order yourself a copy in advance, though they won’t start shipping til sometime in the next couple of months). What does sci fi tell us about feminism?